David was born in Cheltenham and, in due course, won a Scholarship to Cheltenham Grammar School. He left school at sixteen with good academic grades and took up employment with Cheltenham Rural District Council as a junior clerk, studying at night school to obtain the necessary qualifications. When he became nineteen, he was called up to his National Service, being drafted into the Royal Army Pay Corps at Devizes. I was never quite sure how David felt about this episode in his life. In later life he sometimes complained about it but, having seen some of the photographs taken at the time, I did not think he was too unhappy. In 1959, at the end of his two years’ service, David resumed his employment with Cheltenham RDC and, during the following years, progressed through various posts to become Senior Accountant Assistant. During this time David had become a member of the Institute of Revenue, Rating & Valuation Officers, eventually becoming Chairman of the Western Counties Revenue Forum. He was always ready to help a fellow man. He also became an active member of his NALGO branch (the National & Local Government Officers Association, now part of Unison) and, after holding a number of posts, was elected Chairman of the South Western District Council, when I remember spending a wonderful week with him touring the district and being wined and dined by the mayors of the various boroughs. In 1974, following local government reorganisation, David accepted a post with the new Tewkesbury Borough Council. We met through our mutual membership of NALGO and in 1977 we were both elected delegates to the Scarborough National Conference. What better time was there to get married - with time off work, all expenses paid? So we married on the Saturday morning - and attended every session of the conference. Not many people knew that we were actually on honeymoon. David had already bought a house in Northway and we took up residence there. He eventually became a member of Ashchurch Parish Council, chairing several committees. David was one of those people who seemed to excel in anything they attempted to do. Before we married, he discovered that he was quite a good cook and actually won first prize for his sponge cake in a Women’s Institute competition - two years running. Following the move to Tewkesbury Borough Council David progressed through various appointments to the position of Local Taxation Manager, responsible for administering the local ‘rates’. However, in 1990 the introduction of the ‘community charge’, or ‘poll tax’ as it became known, heralded a darker area of David’s working life. Although opposed to this new legislation but charged with its administration, much of the local dislike of the poll tax was aimed at David. He received hate mail, his life was threatened on several occasions, and I still keep a large pebble which was thrown through his office window one Christmas Eve. Consequently we were unable to socialise in the town and I still wonder if the stress of this time contributed to his later illness. Following the demise of the community charge, David oversaw the introduction of the new ‘council tax’ but, as he had completed thirty-nine years in local government, he decided to take early retirement in 1994. If I had expected a quieter life after this for David I was disappointed, as he became a volunteer with the local Citizen’s Advice Bureau, saying that he wanted to put something back into the community to make up for what he had to do during the previous three or four years. 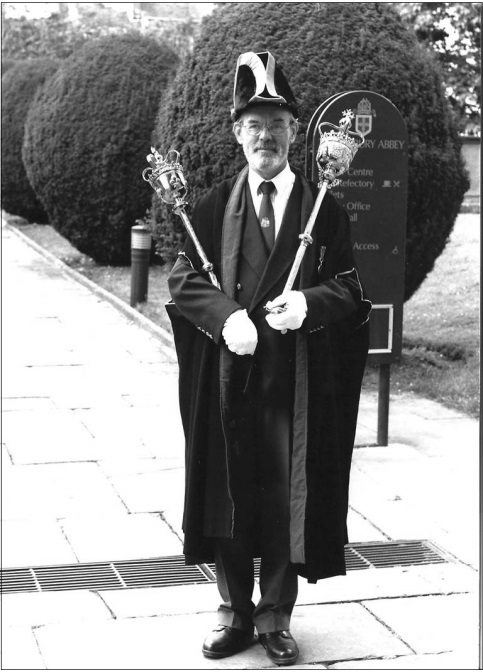 He also became one of the Borough Mayor’s Mace Bearers. Despite the early onset of Parkinson’s Disease, we enjoyed these years. We were able to enjoy foreign travel – even paying a visit to Soweto because of our support of the Anti-Apartheid Movement. We made a number of visits to family in Australia, with stop-overs at Singapore, Hong Kong and Hawaii. David also included Tasmania to follow up his research into the Tewkesbury convicts. David had sought to serve the local community. I am very grateful, therefore, for being part of his life. 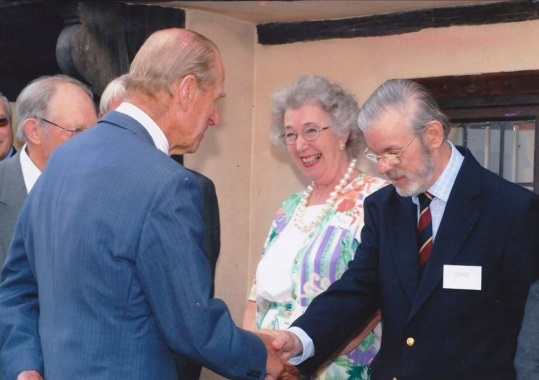 Tewkesbury Historical Society is very appreciative that David did not live a ‘quieter life’ - because the newly retired professional joined the Society, embarking on a distinguished ‘second career’. Sometimes analysis of historical facts can confound. It came as some surprise to find, when the history of the first ten years of THS was written, that David was not actually a founder member of the society from 1991 - such was the depth and breadth of his contribution. The facts state that David did not become Secretary until 1998, the year in which his first article was published. He proved a most reliable Secretary in that he was so well organised, wrote so fluently and was a marvellous diplomatic foil to my impetuous nature. I was, therefore, so disappointed when David announced that he had to retire in 2002 - little did I know the reason. This is now all too evident but, as Marion has explained, the days of his greatest contribution to the society came with the onset of this terrible illness, which robbed us all of so much and which, ultimately, robbed David of his life. The local government officer clearly possessed a love for history and this blossomed into such a real contribution to our knowledge of our town. As well as being Secretary, David coordinated our team for indexing the Tewkesbury Register newspaper, a group which still meets monthly but without David’s calm leadership. His first article for the annual THS Bulletin of research was published in 1998 and it proved that David was becoming the historian of the very important - but overshadowed - non-conformist tradition. His first essay revealed research on the life of Thomas Collins and it won him his first of two Woodard Awards. I was honoured, therefore, to be asked by Marion at his funeral to bear witness to David’s contribution as a historian to the well-being of this historic town and to mark the loss of a good friend.